The Role of Education (Inspired by Brexit) | Kam-Au Amen & Co.
Quite a few folks are upset about Brexit. I completely understand it, and it perhaps seems like a no-brainer to vote for the United Kingdom (UK) to remain within the European Union (EU). But, the votes have been cast and the people have spoken, so we will accept that the UK will exit the EU. 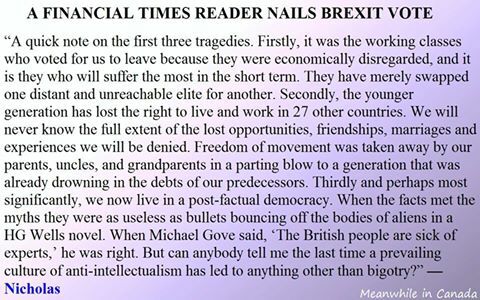 So while looking around Facebook I saw this graphic below titled "A Financial Times Reader Nails Brexit Vote", it is borrowed from Meanwhile in Canada. I read it, and the next thing I realized was that a blog post was trigged, to which I gave in. I trust it stirs some thought in you. In my view educated elites (who often hail from the working classes thanks to public education) have become a pariah in and of themselves. Unfortunately, too many of them once credentialed (and perhaps less so educated) forget (and want to forget) their humble roots. Admittedly, in some instances the very education they receive teaches them, explicitly or implicitly, disdain for the mores of their parents and elders. In far too many of them a disrespect and a disregard for who they are culturally is cultivated, which in turn does not allow education to lift a community economically, but rather only the individual. 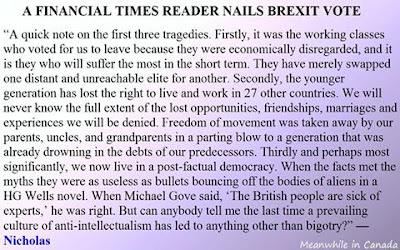 No wonder so many poor older folk see no benefit of education, and intellectualism is sometimes shunned. They too are angry that their offspring have obtained their social passports and have fled to higher society, leaving them in their world to fend for themselves in rapidly diversifying modern contexts. How are they to effectively respond in this new world, when their ideas are often still trapped in a world of pre-industrial notions? What are they to do? So few spend time to share understandings and bring their community along. Youth education should not only be for a personal transition into a higher social class, but I believe it should also extend in service to the immediate community. I know I have some credentialed folk among my friends, and I'd like to point out, that not because you may be in a better place economically, does it mean that your relatives are not hurting economically, socially and culturally. You have a responsibility to validate their concerns in my view. A continued turning a deaf ear, or ignoring some of the issues that may be of concern to them can at some point come back to doom one of your big projects up there in the ivory tower. We're all connected in some way. Each one should teach one, cut the airs (because the only one fooled is you) and the selfishness, but above all, be nice!